If I’ve learned anything during my years of writing about faith, it’s that there are folks out there who absolutely DETEST that word. Most of those people would vigorously agree with the graphic that inspired this essay, which I found on an Internet atheism community. Maybe you’ve never given the word much thought, but now that you’ve read the graphic, you’re thinking “ya, it’s all about ignorance!”. So let’s look at the word for a moment. The Pocket Oxford Dictionary defines it as: 1. complete trust or confidence; 2. firm, especially religious, belief; 3. religion or creed; 4. loyalty, trustworthiness. First off, I want nothing to do with “religion” and this essay explains why: http://wp.me/p2wzRb-eu. Secondly, would anyone in their right mind credibly call someone like Henry Schaefer ignorant? Schaefer, a chemist, earned the 1979 American Chemical Society Award in pure chemistry. He also wrote Science and Christianity: Conflict or Coherence? Here’s another person that no thinking person could ever label ignorant: Ard Louis teaches theoretical physics at Oxford, one of the world’s most prestigious universities. Before that, he managed to get rid of just enough ignorance to teach theoretical chemistry at Cambridge University. What do Schaefer and Louis have in common? They’re Christians. And there are many, many more followers of Jesus Christ out there who are making contributions in chemistry, physics, engineering and biomedical sciences. Schaefer and Louis have what the Pocket Oxford calls “complete trust or confidence” in Christ — His teachings, His death, His resurrection and the truth of what Jesus said about His creator (who also happens to be your creator). Faith is not a positive mental attitude. Faith is not believing I can accomplish anything if I put my mind to it. Faith is not believing if I believe hard enough, like some TV preachers would have us believe, then it’ll become a reality. 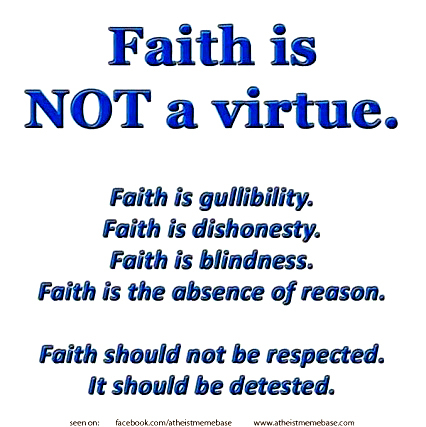 Faith is not faith in our words, it is not faith in ourselves, it is not faith in faith. True faith is in God. The focus isn’t on the faith; but on the object of our faith. From a Christian perspective, faith is having firm belief — based on a mix of evidence and belief — that there is a creator for all that you and I see and experience. And that creator offers you and I a gift: Jesus, whom serious Christians believe is God’s son. Look into that gift. Talk to knowledgeable Christians about Him. Despite what your friends and family may tell you, this is important and serious stuff. And it’s good news.